Medieval times were a different time, for sure! For one, home decorations were sparse. Unlike today, where you could just take some pictures, print up them up, and hang them, or perhaps go to the craft store and make something beautiful and hang it up, neither of those were really possible back then. If you were rich enough — and that was a big if, since most people were not! — you could commission an artist to paint something beautiful for you. The most beautiful places that were accessible to most people, including the common people, were the churches. For one, the churches had some money and were able to afford to pay the artists. Or, alternatively, they trained their monks to become artists who excelled at making beautiful church icons. For another, people back then wanted to have a taste of Heaven by immersed in the beauty of their church, so beautiful art was something that they really wanted and supported for their churches! As you can expect, much (though not all!) of the art from the medieval period is religious in nature. But, that doesn’t mean that the people who commissioned the artwork didn’t want to have their image inserted into the picture in some way. Visitation, from Altarpiece of the Virgin (St Vaast Altarpiece) by Jacques Daret c. 1434-35. Staatliche Museen, Berlin, Germany. 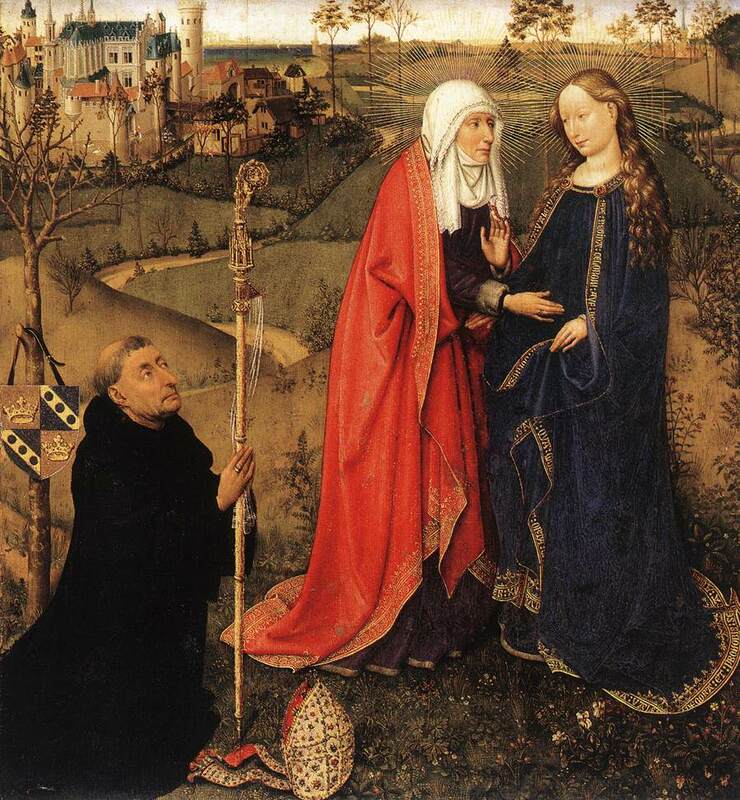 This is a picture of the Visitation, with Mary meeting Elizabeth! Elizabeth touches Mary’s belly, realizing that her Lord is in Mary and rejoices, while Mary looks on serenely. And… right beside them in the periphery of the scene is a man, probably a bishop since he has a miter right beside him (though not on his head), watching on this scene and praying. Most likely, he was either someone that either commissioned the artwork directly or perhaps someone else commissioned the artwork, hoping to impress him. Either way, he is inserted in this image forever! Later, in the Renaissance, the artists got a little sneakier about inserting people into the image, usually as bystanders! But, in medieval times, this was very common, and there are many triptychs whose side panels feature the patrons of the art! At first, this insertion kind of annoyed me, honestly. When I was looking up pictures, I wanted to focus on the religious scene, not have the scene interrupted by various people I didn’t know! Yet, as I saw more and more of these art pieces, I realized that perhaps I was missing something. Maybe it was a good thing that they were inserting themselves in these religious scenes. And maybe I ought to do that as well. After all, it’s easy to get distracted from the stories of the gospel! And it’s so easy to take some of these stories — stories that many of us have known from our early childhood years — for granted. But, to put ourselves in the shoes of the shoes of those who tread the path of the gospel so we can thoroughly immerse ourselves in the gospel? Now that’s a beautiful idea. Help us journey with You and Your Disciples when we immerse ourselves in the gospel. Interested in more artwork of the Joyful Mysteries? You can check out my new book, featuring artwork about the Joyful Mysteries, here!